1 A None No Power Seat 1 A is a standard European-style Business Class seat located at a bulkhead. The adjacent seat is blocked to provide additional personal space. The close proximity to the galley and lavatory area might be bothersome. The tray table is installed in the armrest making the armrest immovable, therefore, slightly reducing seat width. There is no floor storage available for use during takeoff and landing. 1 C None No Power Seat 1 C is a standard European-style Business Class seat located at a bulkhead. The adjacent seat is blocked to provide additional personal space. The close proximity to the galley and lavatory area might be bothersome. 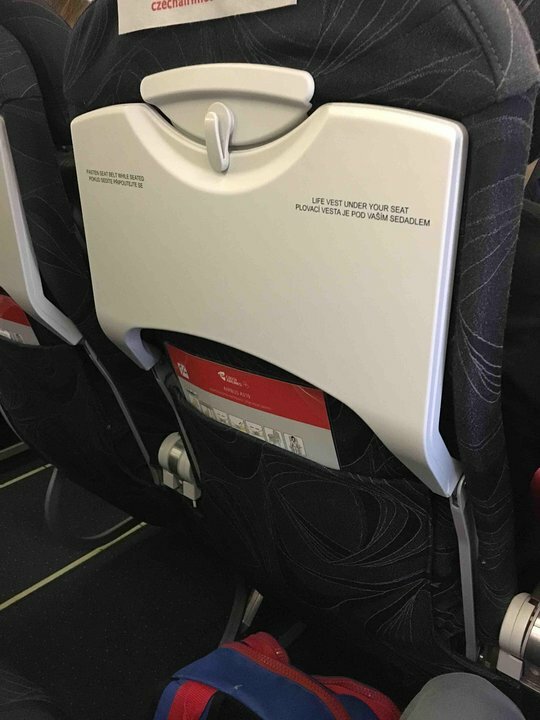 The tray table is installed in the armrest making the armrest immovable, therefore, slightly reducing seat width. There is no floor storage available for use during takeoff and landing. 1 D None No Power Seat 1 D is a standard European-style Business Class seat located at a bulkhead. The adjacent seat is blocked to provide additional personal space. The close proximity to the galley and lavatory area might be bothersome. The tray table is installed in the armrest making the armrest immovable, therefore, slightly reducing seat width. There is no floor storage available for use during takeoff and landing. 1 F None No Power Seat 1 F is a standard European-style Business Class seat located at a bulkhead. The adjacent seat is blocked to provide additional personal space. The close proximity to the galley and lavatory area might be bothersome. The tray table is installed in the armrest making the armrest immovable, therefore, slightly reducing seat width. There is no floor storage available for use during takeoff and landing. 13 A None No Power Seat 13 A is a standard Economy Class seat located in the Exit Row. There is extra legroom in this row. The seat is designated as a Preferred Seat due to its location in the Exit Row. A fee might be charged for selecting depending on the type of fare category selected. 13 B None No Power Seat 13 B is a standard Economy Class seat located in the Exit Row. There is extra legroom in this row. The seat is designated as a Preferred Seat due to its location in the Exit Row. A fee might be charged for selecting depending on the type of fare category selected. 13 C None No Power Seat 13 C is a standard Economy Class seat located in the Exit Row. There is extra legroom in this row. The seat is designated as a Preferred Seat due to its location in the Exit Row. A fee might be charged for selecting depending on the type of fare category selected. 13 D None No Power Seat 13 D is a standard Economy Class seat located in the Exit Row. There is extra legroom in this row. The seat is designated as a Preferred Seat due to its location in the Exit Row. A fee might be charged for selecting depending on the type of fare category selected. 13 E None No Power Seat 13 E is a standard Economy Class seat located in the Exit Row. There is extra legroom in this row. The seat is designated as a Preferred Seat due to its location in the Exit Row. A fee might be charged for selecting depending on the type of fare category selected. 13 F None No Power Seat 13 F is a standard Economy Class seat located in the Exit Row. 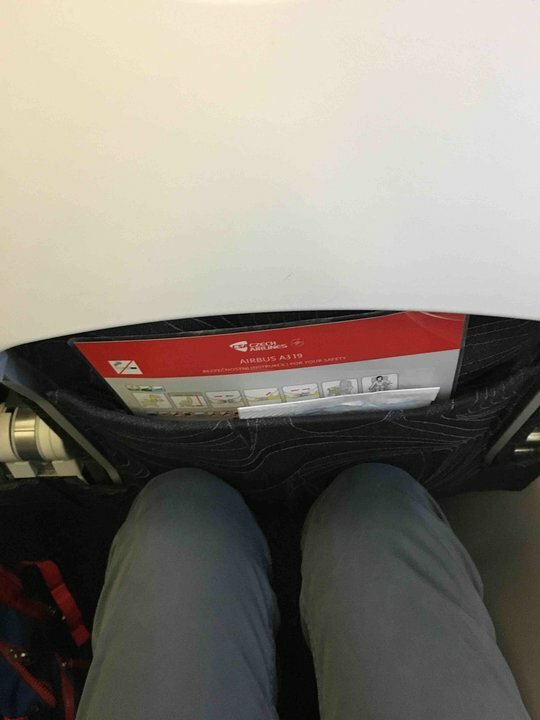 There is extra legroom in this row. The seat is designated as a Preferred Seat due to its location in the Exit Row. A fee might be charged for selecting depending on the type of fare category selected. 25 C None No Power Seat 25 C is a standard Economy Class seat. The close proximity to the galley and lavatory area might be bothersome. 25 D None No Power Seat 25 D is a standard Economy Class seat. The close proximity to the galley and lavatory area might be bothersome. 26 A None No Power Seat 26 A is a standard Economy Class seat located in the last row of the aircraft. Seat back recline might be limited due to the wall of the lavatory directly behind. The close proximity to the galley and lavatory area might be bothersome. 26 B None No Power Seat 26 B is a standard Economy Class seat located in the last row of the aircraft. Seat back recline might be limited due to the wall of the lavatory directly behind. The close proximity to the galley and lavatory area might be bothersome. 26 C None No Power Seat 26 C is a standard Economy Class seat located in the last row of the aircraft. Seat back recline might be limited due to the wall of the lavatory directly behind. The close proximity to the galley and lavatory area might be bothersome. 26 D None No Power Seat 26 D is a standard Economy Class seat located in the last row of the aircraft. Seat back recline might be limited due to the wall of the lavatory directly behind. The close proximity to the galley and lavatory area might be bothersome. 26 E None No Power Seat 26 E is a standard Economy Class seat located in the last row of the aircraft. Seat back recline might be limited due to the wall of the lavatory directly behind. The close proximity to the galley and lavatory area might be bothersome. 26 F None No Power Seat 26 F is a standard Economy Class seat located in the last row of the aircraft. Seat back recline might be limited due to the wall of the lavatory directly behind. The close proximity to the galley and lavatory area might be bothersome. 3 A None No Power Seat 3 A is a standard Economy Class seat located at a curtain style bulkhead. The curtain division might be bothersome. The seat is designated as a Preferred Seat due to its location near the front of the aircraft. A fee might be charged for selecting depending on the type of fare category selected. 3 B None No Power Seat 3 B is a standard Economy Class seat located at a curtain style bulkhead. The curtain division might be bothersome. The seat is designated as a Preferred Seat due to its location near the front of the aircraft. A fee might be charged for selecting depending on the type of fare category selected. 3 C None No Power Seat 3 C is a standard Economy Class seat located at a curtain style bulkhead. The curtain division might be bothersome. The seat is designated as a Preferred Seat due to its location near the front of the aircraft. A fee might be charged for selecting depending on the type of fare category selected. 3 D None No Power Seat 3 D is a standard Economy Class seat located at a curtain style bulkhead. The curtain division might be bothersome. The seat is designated as a Preferred Seat due to its location near the front of the aircraft. A fee might be charged for selecting depending on the type of fare category selected. 3 E None No Power Seat 3 E is a standard Economy Class seat located at a curtain style bulkhead. The curtain division might be bothersome. The seat is designated as a Preferred Seat due to its location near the front of the aircraft. A fee might be charged for selecting depending on the type of fare category selected. 3 F None No Power Seat 3 F is a standard Economy Class seat located at a curtain style bulkhead. The curtain division might be bothersome. The seat is designated as a Preferred Seat due to its location near the front of the aircraft. A fee might be charged for selecting depending on the type of fare category selected. 4 A None No Power Seat 4 A is a standard Economy Class seat. The seat is designated as a Preferred Seat due to its location near the front of the aircraft. A fee might be charged for selecting depending on the type of fare category selected. 4 B None No Power Seat 4 B is a standard Economy Class seat. The seat is designated as a Preferred Seat due to its location near the front of the aircraft. A fee might be charged for selecting depending on the type of fare category selected. 4 C None No Power Seat 4 C is a standard Economy Class seat. The seat is designated as a Preferred Seat due to its location near the front of the aircraft. A fee might be charged for selecting depending on the type of fare category selected. 4 D None No Power Seat 4 D is a standard Economy Class seat. The seat is designated as a Preferred Seat due to its location near the front of the aircraft. A fee might be charged for selecting depending on the type of fare category selected. 4 E None No Power Seat 4 E is a standard Economy Class seat. The seat is designated as a Preferred Seat due to its location near the front of the aircraft. A fee might be charged for selecting depending on the type of fare category selected. 4 F None No Power Seat 4 F is a standard Economy Class seat. The seat is designated as a Preferred Seat due to its location near the front of the aircraft. A fee might be charged for selecting depending on the type of fare category selected. 5 A None No Power Seat 5 A is a standard Economy Class seat. The seat is designated as a Preferred Seat due to its location near the front of the aircraft. A fee might be charged for selecting depending on the type of fare category selected. 5 B None No Power Seat 5 B is a standard Economy Class seat. The seat is designated as a Preferred Seat due to its location near the front of the aircraft. A fee might be charged for selecting depending on the type of fare category selected. 5 C None No Power Seat 5 C is a standard Economy Class seat. The seat is designated as a Preferred Seat due to its location near the front of the aircraft. A fee might be charged for selecting depending on the type of fare category selected. 5 D None No Power Seat 5 D is a standard Economy Class seat. The seat is designated as a Preferred Seat due to its location near the front of the aircraft. A fee might be charged for selecting depending on the type of fare category selected. 5 E None No Power Seat 5 E is a standard Economy Class seat. The seat is designated as a Preferred Seat due to its location near the front of the aircraft. A fee might be charged for selecting depending on the type of fare category selected. 5 F None No Power Seat 5 F is a standard Economy Class seat. The seat is designated as a Preferred Seat due to its location near the front of the aircraft. A fee might be charged for selecting depending on the type of fare category selected. 9 A None No Power Seat 9 A is a standard Economy Class seat located directly in front of the Exit Row. Seat back recline is limited. 9 B None No Power Seat 9 B is a standard Economy Class seat located directly in front of the Exit Row. Seat back recline is limited. 9 C None No Power Seat 9 C is a standard Economy Class seat located directly in front of the Exit Row. Seat back recline is limited. 9 D None No Power Seat 9 D is a standard Economy Class seat located directly in front of the Exit Row. Seat back recline is limited. 9 E None No Power Seat 9 E is a standard Economy Class seat located directly in front of the Exit Row. Seat back recline is limited. 9 F None No Power Seat 9 F is a standard Economy Class seat located directly in front of the Exit Row. Seat back recline is limited. Czech Airlines provides meal and/or snack service on their flights. Meal selection depends on length of flight. Meals are provided without charge in Business Class. Passengers purchasing an Economy Class Plus fare will receive a meal or snack without charge. All others may purchase a meal from the Gourmet on Board selection. A selection may be made prior to the flight on the Czech Airlines website, via the Contact Centre, at a city ticket office, or at a travel agency. Czech Airlines Airbus A319-100 aircraft are used on intra-European flights. The aircraft features European-style Business Class and Economy Class seating. Preferred Seats - seats located at a bulkhead with additional legroom, located at an Exit Row, or near the front of the plane - are available for selection for an addtional fee on this aircraft. Audio and video entertainment provided by Czech Airlines is not avaialble for use. However, overhead drop down screens display a travel map that may be watched throughout the flight. Czech Airlines flies 1 versions of A319-100.